BANGI, 1 Nov 2012 – A Research Group from The National University of Malaysia (UKM) has successfully developed a novel ‘intensified process’ to produce gelatine and hydrolysed collagen from halal agricultural sources comprising cattle bones, fish skins and fish scales. Head of the Scale-up and Downstream Processing group, Prof Ir Dr Abdul Wahab Mohammad, from the Department of Chemical and Process Enineering of UKM said the process was developed to meet the need of halal gelatine and hydrolysed collagen for the world market. The proposed intensified design can be set-up and installed together with the cattle or fish processing plants in Muslim countries. Prof Wahab has high hopes for the project saying that Malaysia can be the pioneer in the production of gelatine and hydrolysed collagen for the world halal market. Gelatine and hydrolysed collagen are used in the production of various type of foods and medical products. The team use “Halagen” as a trademark for gelatine and hydrolysed collagen produced. It can be use as an ingredient in food, capsules, cosmetics and in supplements. The research project was started in 2007 by Prof Wahab assisted by Prof Ir Dr Mohd Sobri Takriff, Prof Dr Abu Bakar Mohamad and Associate Prof Dr Siti Masrinda Tasirin from the same department. The team was joined by Visiting Prof Ir Ad Grobben from the Netherlands who have vast experience in industrial processing of gelatine and hydrolised collagen when the project moved towards the guiding scale. Prof Wahab said the method significantly reduced the processing time by utilising fine particles during the demineralisation stage resulting in less than two days of operation for a batch of the product. The process also utilises advanced membrane filtration technique to fractionate the gelatine and hydrolysed collagen molecules during the separation processes. The use of membranes reduces the energy requirement with a possible saving of water through recycling. 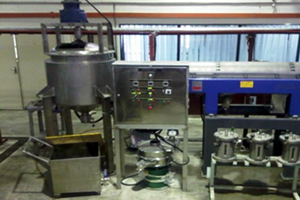 A small pilot plant has been set up in UKM to demonstrate the overall process. The unit operations involved in the process include bone grinding and milling, demineralisation and extraction unit, filtration, membrane filtration, evaporation and spray drying. 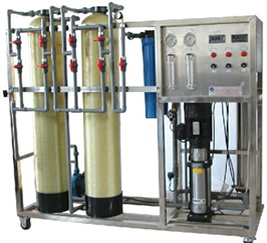 Such an intensified design allows for shorter processing time and smaller plant size which is suitable for localised operation near cattle or fish-rearing areas. 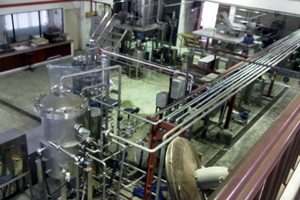 About RM2 million was spent to buy the necessary equipment in setting up the pilot plant. They received the initial funding to set-up the plant from the Technofund of the Ministry of Agriculture and Agro-Based Industry. Prof Wahab said it will cost about RM20 million to set up a factory that can produce about 20 tonne of gelatine and hydrolysed collagen a month. In describing the technology used, he said that the research team utilised current leading edge technologies in reactor design, membrane processes, purification technology and particle processing. Their target was designing a pilot plant that will have higher productivity yield with lower production time using the modular concept to be beneficial in plant scaling-up to a higher capacity. The modular concept can be designed for flexible capacity and scheduling operation. Its compact and intensified design requires smaller footprints thus reducing the processing time for gelatine production to less than one week of operation per batch. Such a design which have proven to produce food and pharmaceutical grade quality gelatine with less intensive water and energy requirements can be easily scaled-up. Mohd Fairuz Mat Isa, the CEO of Altus Technology Sdn Bhd, a UKM Technology company formed to market the two products, said: ”Our company proposed the technology in producing halagen’s hydrolysate gelatine from sources that have no religious restriction (halal) especially fish bones, scales and skin. He said that hydrolysed gelatine is one of the best sources of the amino acids (protein building blocks) that comprise collagen. It is often found in vitamin or nutritional supplements to help in connecting ligaments, tendons and joints. When used in food, the hydrolysed gelatine acts as a micro-encapsulation of flavours and food colours, a substitute for carbohydrates in sweets and other fat containing foods. In pharmaceutical, the hydrolysed gelatine acts as a film forming agent, micro-encapsulation, tableting and nutritional formulas. For meat products it becomes a source of protein and also as a binder and stabiliser while in dietic food and drinks, it is also a source of protein, formation and stabilisation of foams, muscle building and recovery and increase shelf life, “ Fairuz said. Prof Ir Dr Abdul Wahab Mohammad can be contacted at Department of Chemical and Process Engineering, UKM, 43600, UKM Bangi Selangor. Tel: 603-89216410, Fax: 603-89216148. Email: wahabm@eng.ukm.my.